Taking out your competition, legally, who is next for Apple after Samsung? Tremendous result yesterday for Apple in their bid to stay king of the hill. I won’t argue the merits of the case or hold favor with one side or the other but instead focus on the strategy that Apple is using to eliminate threats and how we can use the market response to the user experience to anticipate Apple’s next target. It’s no secret that their growth in North America is slowing as we near an iPad or iPhone for every household in America. So now sales come mainly from replacement of existing devices and Apple’s walled garden is opening more doors as other operating systems and hardware platforms catch up, meaning that when it comes time to replace your aging iPad or iPhone, there are viable alternatives that tantalize consumers to switch. Our analysis shows that for Tablets, Samsung poses the greatest threat to the iPad experience as rated by customers, even though the new iPad had a rocky start. Looking at the delight and buzz levels of the major manufacturers, you can see that Acer or Toshiba might be next on Apple’s legal hit list. 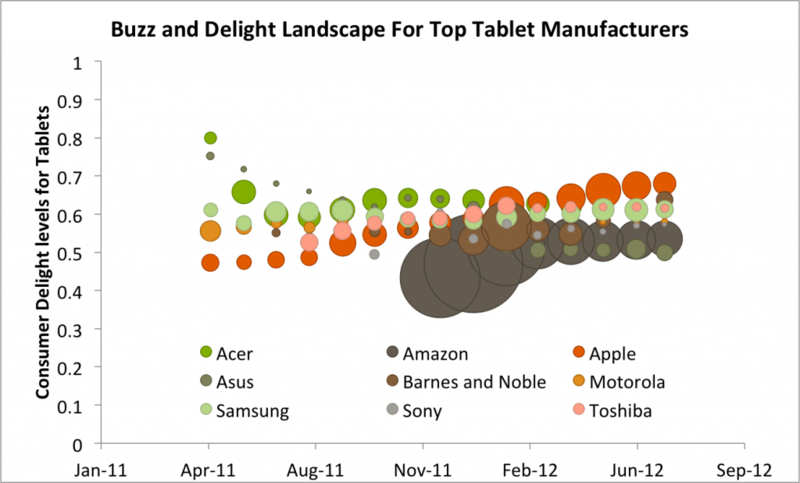 Toshiba’s Thrive and new Excite are both doing well in the battle for marketshare in the “nottheipad” segment. When we turn our sights onto Smartphones we see a different landscape evolving for Apple. In the Tablet market, the default consumer choice is the iPad, especially when faced with a dizzying array of seemingly identical Android competitors. 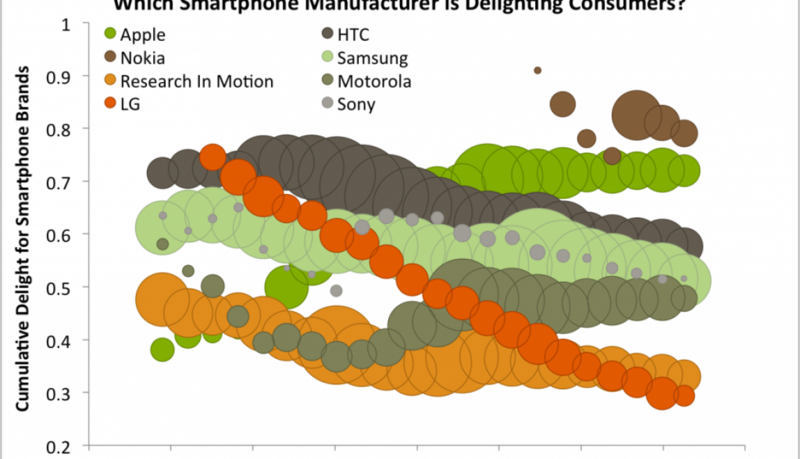 When we look at mobile, there is real competition for the top spot. Nokia now holds the top thanks to the stylish tiling interface of Metro, which is also driving up interest in the upcoming interest in Windows 8. The market is holding it’s breath waiting for the next iPhone to see if their latest mobile dreams will come true or whether the magic is waning. 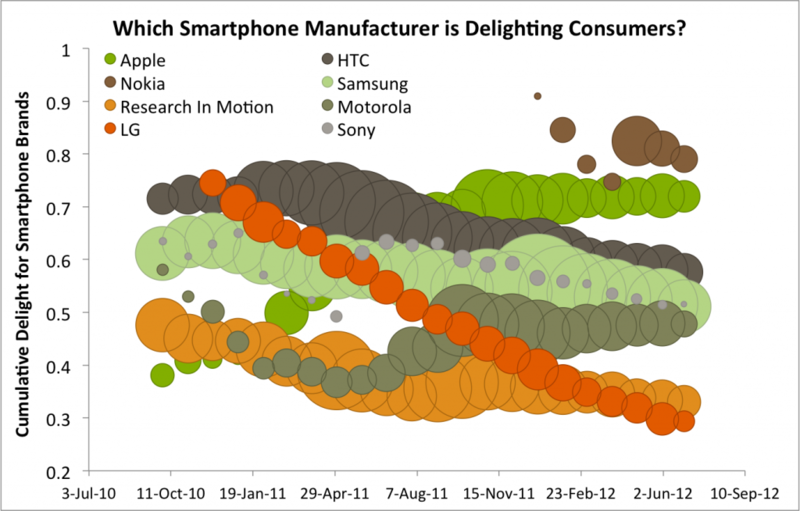 As you can see, the iPhone is still doing well against it’s rivals outside of Nokia, but now that Nokia has returned to the US market, albeit later and slower than expected, Apple finally has competition worth worrying about. Will they use the same legal stratagem against Nokia that worked against Samsung? Arguably Nokia can assert more IP against Apple than Apple can against Nokia so this next round will be interesting, especially since Nokia is on a tag team with Microsoft in this latest smackdown. Let us know if you have any questions as to where these markets are going. Argus Insights unpacks the why behind market performance and crafts predictive models of where the market leadership is going next. We’ve successfully called Apple’s iPad shipment surprises for the past several quarters. Imagine what we can do for you!